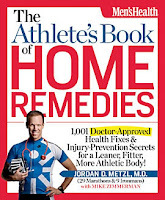 Jordan D. Metzl, author of The Athlete's Book of Home Remedies shows you how to heal faster, train smarter, and build an injury-proof body. To prevent your next injury, I recommend starting now. And my most important advice is to train your entire body. Switch up your activities and hit all the muscle groups, even if you play only one sport. I teach weekend plyometric strength classes that involve functional body motion. I'm a huge fan of this; it trains your body for real-world movement. Why does this work? It's all about your kinetic chain, which is jargon for the series of body parts—including muscles, ligaments, joints, and connective tissue from your neck to your feet—involved in a movement. Your kinetic chain operates interdependently as one system: feet muscles working with ankles working with calves working with knees working with quads, hammies, and hips—all the way up to the top. That's why total-body conditioning helps keep you injury-free: If it's a chain, what do you think happens around a weak link? Exactly. Muscle imbalances eventually cause injuries. Here are some smart ways to increase your total-body conditioning, as well as hit areas that a lot of guys—even active guys—neglect. Compound your exercises. Whenever you can, work multiple muscles with a single exercise. If you do a forward lunge, for example, do it holding a medicine ball and add a core twist. And after that forward lunge? Do a reverse lunge and side lunges as well. Hit all directions. That's how you achieve muscle balance. Stay single. Do single-leg exercises. In my strength and conditioning classes, I have people do single-leg squats, single-leg hops, single-leg lunges—exercises that allow them to use their own body weight while also maintaining their balance. Twitch it up. Depending on your sport, you may be doing this already. But if you're not—if you train for steady-state sports like running or cycling—try adding one or two total-body plyometric and interval (sprint) workouts each week. Neither requires a gym or any special gear. Why do this? It's vital to maintain a balance between fast-and slow-twitch fibers. You become more athletic and less prone to overuse injuries, and you keep your body ready for any type of challenge. Join the women. Yoga and pilates, gentlemen, yoga and pilates. I can't recommend them enough. These disciplines deliver dynamic, movement-based flexibility that can transform your body. Pilates also hammers your core. You'll feel more powerful, and your movement will be easier and more fluid. Feel kneaded. I'm a big believer in massage. It feels great, of course, but you're also keeping your muscles supple. Plus, a good massage therapist can feel where your muscles might be chronically tight and setting you up for potential problems down the road. Shoot for two massages a month. Rehab in your sleep. If you take nothing else from this story, know that sleep is the most important activity of your day. This is a huge blind spot for so many people, especially if they're training hard. Sleep gives your body an opportunity to repair and rejuvenate itself as it rebuilds muscle, strengthens bone, restocks red blood cells, and engages in other crucial processes that take time. 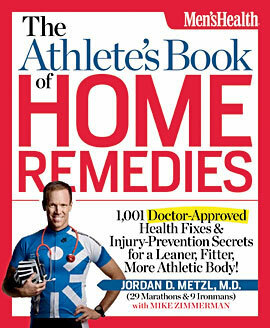 Read more here at Men's Health. Like many, Michael Mosley want to get fitter and healthier but can't face hours on the treadmill or trips to the gym. Help may be at hand. He uncovers the surprising new research which suggests many of us could benefit from just three minutes of high intensity exercise a week. He discovers the hidden power of simple activities like walking and fidgeting, and finds out why some of us don't respond to exercise at all. Using himself as a guinea pig, Michael uncovers the surprising new research about exercise, that has the power to make us all live longer and healthier lives. Good website! I truly love how it is easy on my eyes it is. I am wondering how I might be notified whenever a new post has been made. I have subscribed to your RSS which may do the trick? Have a great day! Top 10 steps for Pregnancy planning?